I was thinking about Budd Zzzyp today. If you lived in Manhattan in the 70s, you've thought about him, too. His was the next-to-last name in the white pages. The last name on that page was something unreal and unpronounceable, made entirely of Zs and Ys. Budd Zzyzp was if not exactly an acquaintance at least a recognizable person, reliably occupying the same space one year after the other. For a city full of transients, that was comforting stability. Some years later in a little throwaway filler in The New Yorker magazine, I found out that Budd Zzzyp wasn't real. The name was listed there by a well-known NY personage named Buddy Jacobson. The occasion of this revelation was that Buddy had been arrested for the grisly murder of a romantic rival and Budd Zzzyp, a device to help people remember when they wanted to contact him, would be listed no more. Googling "Budd Zzzyp" doesn't net much, but looking for "Buddy Jacobson" leads to a book that was written about the whole sordid thing. Horse racing, drug smuggling, a "modeling" agency that shared a phone number listing with Budd Zzzyp, romance of a sort followed by the murder, an escape from a NYC prison with a manhunt that ended in California 40 days later where Buddy was taking skating lessons in anticipation of buying a roller rink - that sounds like it's worth a dollar from a used book site, doesn't it? I ordered the book today. This is why I have nothing to say when people ask me what I'm reading. I can't easily explain my taste in reading material to the Oprah Bookclub people or to those who are busy with the paperback best sellers from the airport bookstore. All of this phone directory nostalgia reminded me of Mrs. Alice Coolbaugh. I can't forget her, either. Flash back to Wilkes-Barre, Pa circa 1968-ish. My mother came home from the dress factory one day with one of those little math tricks that ends up in a predictable number. This isn't mathematically correct - just an example here - but it was one of those things like "Take the number of letters in the month you were born, multiply by 5, add 2 and divide by three. The answer is 18." And the answer was 18. "Now" she said, "take the phone book and open it up to page 18. The 18th name on the 18th page is Mrs. Alice Coolbaugh." Sure enough, Mrs. Alice Coolbaugh. Somewhere along the line, my mother revealed that the answer to the math trick was always 18 so she already knew the name that would be revealed at the end of the trick. Even then, I didn't have enough interest in math to explore the multiply/add/divide logic but I did try it out one more time on the sly using a different month as a starting point and it was still Alice Coolbaugh. I lost interest in it after that, but I was sufficiently impressed to remember that name for the rest of my life. So that's all there is to the story. But I was unwilling to give up my seat on the nostalgia train, I typed her name into the Google search box, and would you believe that the very same woman is the #1 search result? To my surprise, there are 11 pages of results for "Alice Coolbaugh". Maybe it wasn't a math trick after all - maybe she's the 18th name on the 18th page of phone books all across America. You'd better go look at yours. Which is it? Does related stuff swirl around all the time and you never notice it, or is it that when you get interested in something, you send out a magnetic force that attracts things of like kind? Yesterday, when I first discussed this book, I wanted to say that I was pleased to find out that the setting was Essex County NJ. The novella was published in 1959 so I was curious to see if the landmarks were still there and still had the same look. My first search was for a look at he lions in front of the Newark Public Library. While there are contemporary pictures of the building and images from 1910, there are no lions to be seen. It appears as though there possibly could have been large statuary along side those steps, I'm afraid that the lions, possibly inspired by New York's Patience and Fortitude, were used here as a symbol of establishment. "Down Washington Street, behind me, was the Newark Museum - I could see it without even looking: two oriental vases in front like spittoons for a rajah, and next to it the little annex to which we had traveled on special buses as schoolchildren." I was happy to see photographic evidence that the spittoons are still there, or at least in 2006 they were. Today I was visiting a few of my regular stops around the web and linger for a long time over the newest Square America series, African American Portraits and Snapshots and thinking about the instances that Roth used African Americans in the book as the literary pegs that Neil Klugman hung his outsider status upon. Admiring the old photographs and thinking what it must be like to view them in person led me to cruising further around the website. 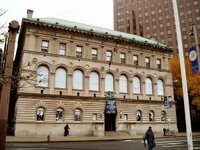 This brought me to a page that anounced that "the Newark Museum will be having an exhibition of snapshots from the collection of Frank Maresca which will open on February 13th." So now, let me ask again:Does related stuff swirl around all the time and you never notice it, or is it that when you get interested in something, you send out a magnetic force that attracts things of like kind? It seems to me like destiny. I'll be going. I chose this book because I had a misty memory of seeing the movie in the very early 70s and my fondness for Richard Benjamin and the enduring vision of Jack Klugman pouring ketchup on his fancy dinner led me to remember that this piece was a comedy. The joke was on me. This was Philip Roth's first book, for which he won the National Book Award at the age of 25. You can read any number of scholarly discussions about this novella - it spans only 98 pages in an octavo edition - about classism and assimilation, traditionalism and breaking free, belonging and being an eternal outsider, love and lust. It's not for me to discuss the psychoanalysis of the underlying themes - this isn't meant to be a research article. My purpose here is to record my impressions. I've read Roth before, most notably Portnoy's Complaint, and was impatient to the point of boredom with the narcissism and self-absorption. It's interesting to read this first published book and see that Roth burst onto the scene as a fully formed narcissist - it's the main theme in this work and the others that I've read. Here is more honest and contemplative than in Portnoy, where it's arrogant and calculatedly stingy. "The pale cement lions stood unconvincingly on guard on the library steps, suffering their usual combination of elephantiasis and arteriosclerosis, and I was prepared to pay them as little attention as I had for the past eight months were it not for a small colored boy who stood in front of one of them. The lion had lost all of its toes the summer before to a safari of juvenile delinquents, and now a new tormentor stood before him, sagging a little in the knees, and growling. He would growl, low and long, drop back, wait, then growl again. Then he would straighten up, and, shaking his head, he would say to the lion, "Man, you's a coward ..." Then, once again, he'd growl." He's caught by the image of himself, challenging establishment with baby steps. Until this scene, it's been merely an observational narrative. Now, when he dwells on his own reflection, this is when the words become real and you cannot help but to feel that what you are reading is genuine. This is story of love and lust. The lust is transient; the love is for himself. As previously threatened, I am going to be writing about books that I'm reading. It's mostly for my own sake because whenever anyone asks me what I'm reading, I always go blank and lose my turn in the conversation. My plan is to write my opinions here so that the information is burned into my brain and I'll more readily have the answer the next time the question comes up. I would welcome a community conversation to, so if you've read any of my selections, please do pipe up. I came across a thread at Metafilter about Barbara Pym. The terms "effulgent humor", "powerfully visually evocative language"and "wonderful writer" were used. so I thought I was missing something. I sent my $1.00 to Abebooks.com and in a matter of 5 days, the book was here. That is 5 times longer than it took me to read it. Its not exactly a romance novel -more of a romance denied novel, smoothly written with a well-paced and easy flow, but not above the level of the "novel of the month" that used to be found in the back of Good Housekeeping magazine. The characterizations remained intact with no questions raised as to continuity.That's about the best thing I can say for it. Its a look into the world of spinster women in the 1950's London, as told through the inner dialog of the main character. The excellent women of the title is a patronizing sobriquet for the do-gooding spinsters and church ladies who lie on the fringes of married society. The arena of action is narrow with few characters, and underdeveloped ones at that. The device that drives the story is undiscovered potential not matched to conventional societal expectations. Hopes are raised in the early pages for a satisfying development of this but, sad to say, those hopes ultimately go wanting. The one thing that did make an impression on me was the meager fare that passed as supper here - most often a curl of cheese that had been around for a while, maybe some stale bread and tinned fish. The only time food was given any more prominence is when the dialog was set in a restaurant, and that was always driven by the action of a male friend. I suppose that is a metaphor for the ladies having a dull and colorless time of it on their own compared to the good life when they are accompanied by men, but that is as good as it gets here. Really, any Harlequin Romance novel can do that for you. My opinion is that it's hardly worth further discussion. In the end, I was underwhelmed. I should have known better than to take a cue from the pretentious knuckleheads at Metafilter.